Peter Drucker came of fame and popularized the word knowledge economy. He got his ideas from the likes of Schumpeter, Machlup and others including earlier management gurus like Taylor. What are these people calling knowledge economy? They say their knowledge economy is a part of human evolution, they are a product of their times when wave theory was a wonderful tool of viewing the world and the future. These wave theories where first categorized intellectually by an economist known as Nikolai Kondratiev. He talked of stages of progress, and the stages have been standardized as agricultural/ pre-industrial, industrial revolution, steam age, mass production, oil power, and age of information and technology. Of these stages, those talking of a knowledge economy are talking of the latter stage, the age of information and technology. They are talking about an economy and the associated industries at a certain stage of human evolution. 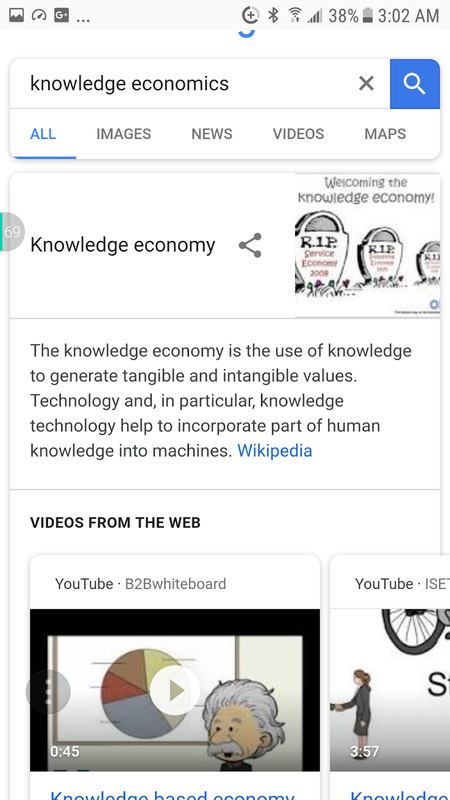 The term knowledge economics came along, and they have fudged with their definition so much that their definition of knowledge economy doesn’t even correspond with what they are considering. Knowledge is facts that we have, that has been the definition of knowledge since time immemorial. 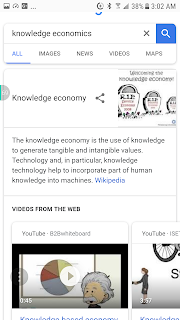 Knowledge economics merely studies these facts we know that we have commodified, it does not look specifically at a certain stage of human development like those who talk of the knowledge economy. Knowledge economics looks at knowledge and knowledge behaves the same be it pre-industry or after this phase of human evolution. What does knowledge economy tell us about knowledge the resource itself? The reality is it does not say much, it uses knowledge in mystical ways, because it does not need to truly understand knowledge itself because it is talking about a certain phase of human development. Knowledge economics needs to understand the resource knowledge itself, facts we know, and we know cavemen had facts that they knew, or they would not have been able to get food, it is as simple as that. That we exist means humans in the distant past, in the very beginning had facts that they know, simply to eat you need to know what to eat. Knowledge economics shows us that knowledge is nothing more than information we know, and thus knowledge behaves exactly like all other information. Knowledge economy doesn’t care about this as it is looking at a phase of human development, like those who study the steam age. Thus, knowledge is discrete as all information is discrete, each piece of knowledge is independent this allows us to be able to learn things. Everything is information, you reading this are as much information as a galaxy, those merely studying the knowledge economy can never grasp this fact because the knowledge economy and knowledge economics are not the same thing no matter how much the crabs try and drag the other crab back into the basket. Knowledge economics acknowledge that everything is information, it acknowledges that all disciplines can only study information, albeit different aspects of information, thus acknowledging that all disciplines are one, separated only by the aspect of information they are looking into, and the different levels of complexity of that information, only accepting everything is information can we appreciate this fact. What has the concept of knowledge economy to do with that? Dealing with facts we know and understanding that we only no a part of the whole (this whole, all the information is konke, a Nguni word meaning everything), and knowledge economics deals with that part of everything that we know and commodify, this is economics not just economics of a phase in human development. Everything is just information because everything informs us what it is. Understanding this, knowledge economics can take advantage of the first law of information, that merely states that every relationship involves a loss of freedom, this applies to everything in existence. Knowledge economics takes advantage of this law and allows us to understand the ideological question in socio economics in another way. Quoting from the paper Knowledge Economics: Summary and Rationality, “the ideological side of economics deals with the question, there is a loss of freedom, but there is a benefit, how best do we maximize this benefit whilst minimizing the loss of freedom?” This has nothing to do with a phase in human development, this has to do with looking at facts and commodifying those facts that we know and staying in line with the universal laws of information, universal laws of information that affect the knowledge economy but also pre-industrial society a depth that those studying the knowledge economy do not have to deal with. As knowledge economics deals with commodified information it cannot escape the reality of the algorithm of information and thus understands the pervasive influence of probability on all information, thus affecting our view of rationality. An action can not be known to be rational except in the future, and all information in existence is restricted in the choices available to it. Even in the freest society there is a limited amount of candy you can choose to buy, the most basic of particles has limited choices, it can not be everywhere, the hydrogen particles in the sun are not here and there at the same time. The wildebeest has limited choices for drinking water. Tyrants have always wanted to control flow of knowledge, the Popes wanted all knowledge to seem to come from them, thus Galileo’s predicament, colonisers want it to seem that all knowledge comes from them. To control this, they always make it irrational to chase after knowledge if you are not one of them, just as a slave master threatens death if a slave escapes to make it more likely to be irrational to try to escape. The powers that be have determined the world needs not know what a black think, he must merely get answers to the bigger questions of existence from others. It has been made irrational to pursue knowledge, Google, claiming that net neutrality means control of the internet want to control it themselves. Type knowledge economics and google will always direct you to knowledge economy, even though the two are completely different, the idea is to control black thought, hide it, what right does a black man have to show the existence of laws of information, algorithm of information, stick to what whites have to say about knowledge and economics, no matter how shallow that discipline is. We have to accept this reality, and tell the truth to ourselves no matter what they say the owners of google and other tech companies are out to promote their own, not truth as such, that is why liberty is important, it goes back to that question knowledge economics raises, “how best do we maximize this benefit whilst minimizing the loss of freedom” With liberty the black man will have a way to create their own search engines, encyclopedias on the net, social sites, Artificial Intelligence, mine our own resources, without liberty Blacks are open to the same old lies and being swindled materially, artistically and intellectually, actions always speak loudest, type knowledge economics on google, obviously acting in behest of a larger group otherwise why would google be acting as it does. Anybody who believes in freedom will never behave like this strange entitled cabal fighting knowledge.